Mr. Pomrenze has been mentioned previously in our blog posts, as he played an important role in identifying material of permanent archival value at the Federation of Jewish Philanthropies (and many other organizations) as a consultant in records management and archives. But Mr. Pomrenze has been especially on the minds of the archivists and staff at The American Jewish Historical Society. In addition to the Society’s holdings of his papers, the “Colonel” will be honored next month at the AJHS Emma Lazarus Dinner with the Legacy Award for his role as one of the Monuments Men and his supervision of the restoration effort at the Offenbach Depot, where the Germans stored more than 3 million looted Jewish works. While processing Executive Vice President material from Stephen Solender, we encountered a folder called Colonel S.J. Pomrenze, 1980-1981. The contents of the folder detail the process that Mr. Pomrenze went in order to round-up/create the Solender Family papers (P-554) from material in New York, Baltimore, and elsewhere. The correspondence within the folder provides great insight into the process that Pomrenze went through, as a consultant, to create a family archive. There is correspondence between Pomrenze and the American Jewish Historical Society (Nathan M. Kaganoff), American Jewish Archives (Jacob Rader Marcus), Associated Jewish Charities & Welfare Fund (Stephen Solender) and Sanford Solender while he was Executive Vice President at the Federation of Jewish Philanthropies. Colonel Pomrenze’s consultant notes on possible locations and archival sources for the creation of the Solender Family Archives. The folder shows another facet of Colonel Pomrenze’s life as a consultant, archivist, and records manager. Since the material sheds so much light on the related collection, we currently plan to relocate the folder to the Solender Family Papers where it should enhance the administrative clarity of how that collection was formed. James R. Dumpson died last week, according to his obituary in the New York Times, from which the following quotes are taken. What is the connection between Federation and Mr. Dumpson? 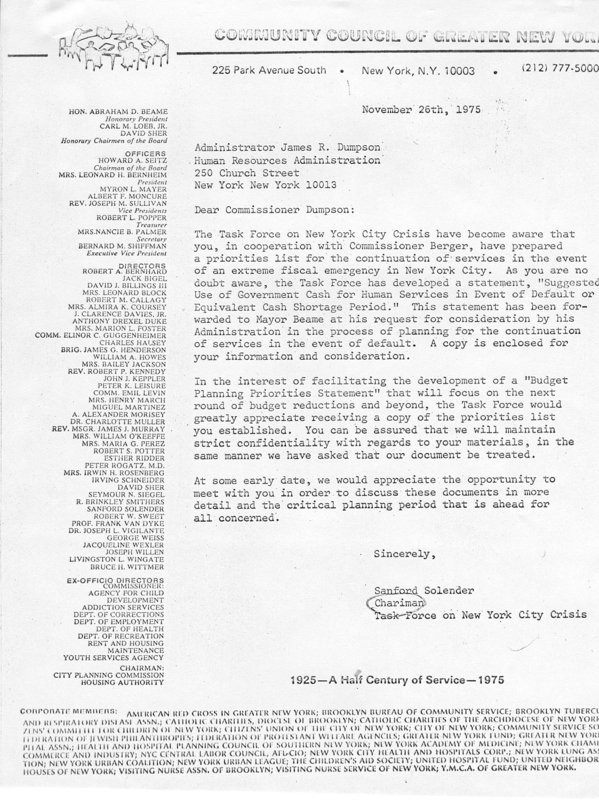 While processing the papers of Sanford Solender, there were many files documenting Solender’s work with the Community Council of Greater New York’s Task Force on the New York City Crisis. This group of files was found to contain correspondence and other information from Dumpson’s office. 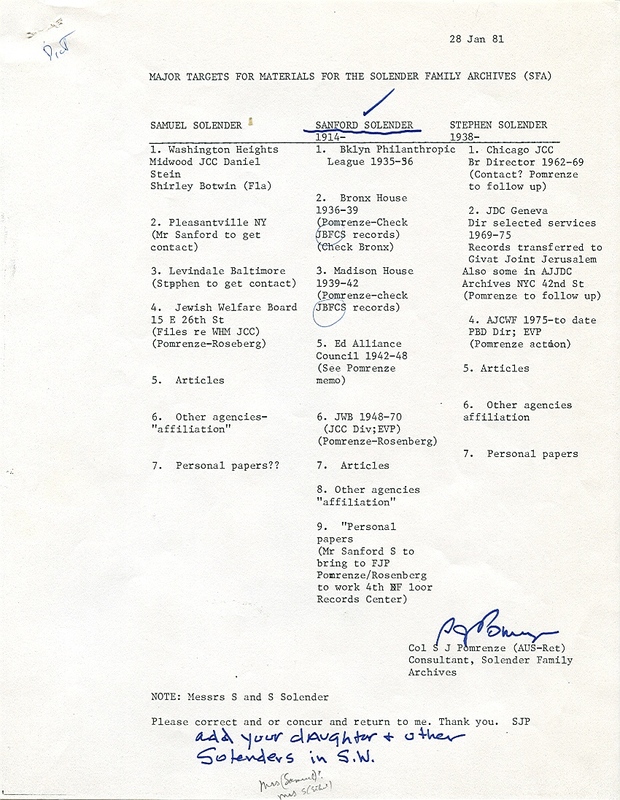 Solender was the chair of this task force from about 1975-1977, and there are 3 feet of files in the collection that document his tenure in this position. For more information on Sanford Solender’s involvement with this task force, see our earlier post on the Community Council. Dumpson was brought onto the task force early in 1976 as a consultant because of his expertise in areas of social services in New York City, and no doubt because of his sympathetic attitude towards the work of not only Federation’s agencies, but all of the social services agencies in New York City during this daunting fiscal crisis.